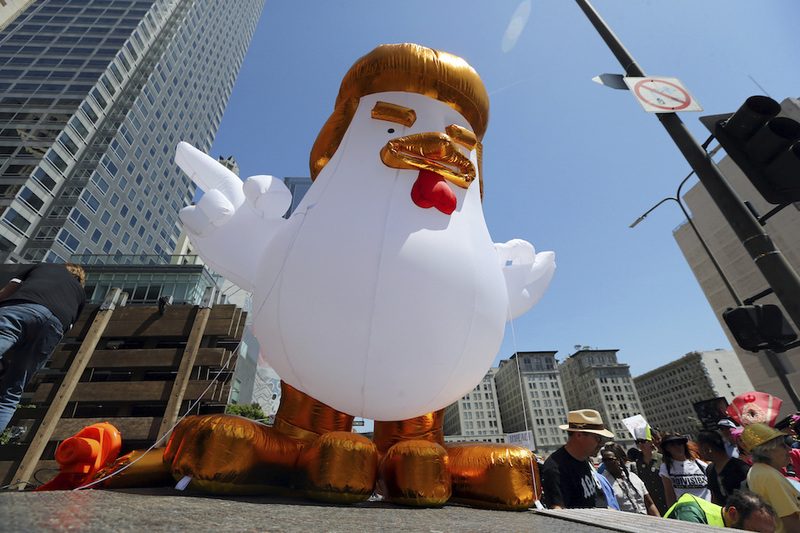 CHICAGO (AP) — Thousands of sign-waving, chanting protesters marched through streets across America demanding that President Donald Trump release his tax returns so the public can examine his business ties and determine whether he has links to foreign powers. The tax day protests in more than a dozen cities Saturday were largely peaceful, though occasionally demonstrators and some pro-Trump groups taunted each other in face-to-face exchanges. In Berkeley, California, police arrested at least 20 people after fist fighting erupted at separate unrelated rallies at a park where about 200 people for or against Trump gathered. Officers confiscated knives and makeshift weapons. PHOTO: The demonstrations came just days before Tuesday's deadline for taxpayers to file their returns. Trump was the first major-party nominee in more than 40 years not to release his tax returns, saying it was because he was under audit. He later said that voters don't care. One of Trump's sharpest critics in the House spoke to protesters at the U.S. Capitol just before they set off on a march to the National Mall in Washington, D.C.
Democratic Rep. Maxine Waters, of California, said there's nothing to prevent Trump from releasing his income taxes and that "the simple truth is he's got a lot to hide."